Dave Senatillaka took the 3000-mile flight from Boston to Oakland with limited expectations. He came to learn. To share. To stroll around San Francisco for day of sight-seeing. But most of all he came to wonk-out with his fellow housing enthusiasts at YIMBYtown 2017. “I’m very new to the YIMBY movement, but I’m here to gain more knowledge so I can bring it back to educate myself as well as educate my town leaders,” said Senatillaka of Malden, Mass., three miles outside the Boston city line. 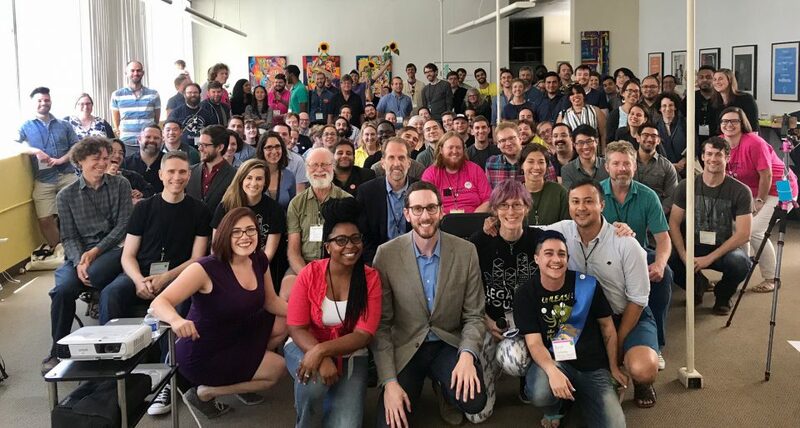 Senatillaka was among the 150 or more YIMBYs who flocked to Oakland this past weekend for three days of all things housing. London, Boston, Seattle, Vancouver and even Nantucket, Mass. were in the house as housing activists of all stripes shared experiences and swapped tactics. It was only the second such gathering of its kind. Last year’s freshman effort in Boulder, Co. featured Sara Maxana’s epic keynote. This year, East Bay Forward picked up the torch and brought it back home to the Bay Area — the birthplace of the YIMBY movement and symbolic poster child for how high rents can rise if housing shortages are ignored. Seattle-based housing activist Laura Loe kicked off the first full day of the conference with a powerful keynote (31:00) which set the bar for the rest of the weekend. Among her solutions was the need to take in consideration folks impacted by land-use decisions, but don’t have the the ability to attend city council meetings or the time to be an active urbanist. “We need to seek out and fund leaders for land-use conversations who have similar stories and backgrounds as folks who are often shouted down in their lives, not invited to participate in policy conversations…women, immigrants, people of color, queer folks, folks experiencing houselessness…there’s such a long list of people who cannot easily access this stuff,” said Loe. Loe also explained her preferred label. While she prefers the acronym YIOBY (Yes In Our Backyard) instead of YIMBY, she’d much rather be defined by the work she does. On Saturday, Senator Scott Wiener (D-11) hopped on BART for a keynote Q&A about state level politics. Wiener discussed his SB 35 legislation along with the need for environmentalists to stand up to fight more housing. He cited that 40 percent of California greenhouse emissions come from the transportation sector. Wiener spoke among a loud backdrop of 10 or so protestors who chanted “Not Your Backyard.” Many YIMBYs responded they had grown up in the cities where they now sought more housing. And it was only fitting that Sonja Trauss closed out the three-day gathering with her closing keynote. She spoke of her journey from Philadelphia to the Bay Area and broke the news that the beaver was voted as the official mascot of YIMBYtown. The emoji-less beaver beat out the sunflower by a narrow margin. Laura Clark, executive director at YIMBY Action, said after the gathering wrapped that the movement is gaining momentum. And fast. Next on her agenda is continuing the fight for statewide legislation alongside California YIMBY-in-chief Brian Hanlon who will be moving to Sacramento in September. Clark said she learned new strategies on how to communicate with people that disagree with her message. Clark was excited to hear from YIMBYs nationwide that the content her organization generates, including her INFILL podcast, inspires them in their own organizing. “It’s good for me to hear from YIMBYs across the country that the stuff we produce is helpful for them and keeps them motivated and makes them feel like they’re part of this international community,” she said. Next year’s conference will be convened by A Better Cambridge and held in or around Cambridge, Massachusetts.